I'm going to show my age here - and at my age be thankful that's all I'm going to show - but I can recall growing up as a kid in Toronto and we had one telephone in the house. It was a wall-mounted, black rotary-dial affair behind the door in our kitchen. If you stretched the cord you could actually sit down at the kitchen table while you talked on the phone. This was in the mid-50s, hardly on the heels of the device's invention, nevertheless - having been patented by Alexander Graham Bell in 1876 - it was still in it's formative years. Coloured models, the Princess phone, and the push button model were all yet to come, to say nothing of wireless home phones and the cell phone. 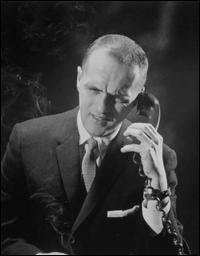 The telephone, by the way, figured prominently in comedian Bob Newhart's early stand-up routine. In the late 50s/early 60s Newhart made his mark using a telephone as a prop and having hilarious one-sided conversations. It was a device he used for years. The telephone also played a central role in one of my favourite 60s television shows. The running gag in Get Smart was his shoe phone. And when cell phones first came out, although they were the size of a brick, I always called mine my shoe phone. In comparing phones of my youth to the devices available today not all that much has changed. Today we have 3 way calling. Big deal. I remember having a Party Line, where we shared the phone line with someone else and could listen in on their conversations. Who needed Entertainment Tonight when you had a Party Line. Today you can program a distinctive ring tone for selected friends' and relatives' incoming calls. In the 50s a Party Line meant you had your own distinctive ring like 3 short rings or 2 long ones. Today's iPhone has an array of apps of every description. Back then we weren't so hard-pressed to entertain ourselves and we didn't have to pay an additional charge to phone a perfect stranger, ask them if their refrigerator was running, pause, then tell them they better catch it. And we were far more polite back then. There was no such thing as call waiting which in and of itself is a misnomer. If someone called when we were on the phone they got a busy signal. Today one usually let's the first caller go or puts them on hold in order to talk to the second person that's calling. What the heck does that say to the first person who called? The best thing about telephones in the 50s? Mobile phones were yet to be invented. When you left home, you left your phone behind. Oh, and Bob Newhart? Who would have guessed that today you can watch him doing one of his phone routines on...are you ready...your phone. If you want to know more about the telephone drop by Theme Thursday. I loved the character those old rotary dials had. We never had a party line, but I can see how they would keep a conversation clean and honest. I left my cell phone behind too. Months ago I decided to throw away my watches and anything with a clock on it-including the phone. I still have it and use it but never take it anywhere with me. Ha! Sorry I just had too. I never knew Bob Newhart used a phone for his stand up! I'll have to YouTube him and check it out. I'm sure it was hilarious. Great post and reminder Noname! We must be of the same generation. I rememb er ALL that stuff - the Newhart skits were hysterical - and Get Smart - don't even get me started - off the hook funny. Hey I remember my dad telling me about when my Grandfather got his first telephone ... only HE, the man of the house was allowed to answer it, and he would comb his hair and adjust his suit and tie before answering in a stiff, proper manner, "Good day, this is the Wilson household, Archie Wilson speaking." Don: You threw away anything with a clock on it? My how time flies! Quirks: Oh, yeah, Newhart used a phone to hilarious effect. Can't find an example of these routines on You Tube though. Marvin: Ha, great story. It was a whole other age, wasn't it. I guess we're both showing our age, because I remember this too. For Christmas, when I was 13, Santa brought me a pink princess phone that chimed when it rang. And, an extra bonus, I had my own number! No more of my dad picking up the extension from our green rotary-dial phone that hung on the wall telling me, "It's time for you to slop the hogs and don't forget to drop the corn cobs by the outhouse". That was his way of telling me to get off the damned phone. Stephanie: Oh, yeah, but after a while those cords would get all tangled and you'd have to dangle the phone and let it spin around so it would unwind. Me-Me: You're giving me mixed signals. Was he making it up? 'Cause somehow a Princess phone and corn cobs by the outhouse don't seem to go together. R.J.: Oh, I remember too. i pine for the days you could leave the phone behind and were not expected to be available 24/7. i do like a newhart sketch though...lol. Brian Miller: Technology is a double edged sword isn't it. I had forgotten how funny Bob Newhart was with his phone routines. Thanks for the memories. @ Dufus - Yes, my dad has a warped sense of humor. I once got in trouble during "show and tell" for repeating one of my dad's funny stories. I guess you could say, the apple didn't fall too far from the tree. 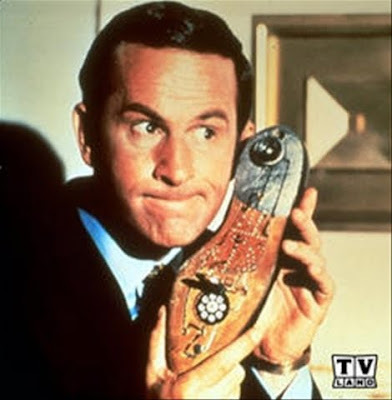 I always loved Maxwell Smart's Shoe phone! Great post! Me-Me: My Dad was like that too. I'm glad I have those occasions to remember him by. e: Was Max ever in any danger? Oh, yes...and loving it! Nooter: Ha, ha, that one's older than the rotary phone. Great post! We were saying the same thing this summer when we went to the beach! Back then, when you went away you were OUT OF TOUCH, and it was okay. Now, we are expected to have our cell on vacation and even in the sand! Enough is enough! Wings: You said it. Enough with the cells phones and Blackberries and the 24-7 availability already. Great reminders of Bob Newhart and Get Smart. I loved your comparison of today and yesterday's phone capabilites. In so many ways, you are right. A lot is the same except we have to pay so much more for it now. Ronda: Technology's come a long way but "cost" isn't the only price we've paid,is it? I agree that call-waiting can be rude, but it's also very useful. Depends on the person's phone etiquette, I think. Jeff: I don't get putting someone you're talking to on hold in oder to take a call from someone else who could just leave a message and be called back. VE: Read your post, funny. You might be able to knock me out by pitching a cell phone at me. Very enjoyable musings! I hate call waiting too! Ah, Max's shoe phone. What a great show that was. "The old 'MELVIN BEHIND THE DRAPES' trick." I loved rotary phones. That clackety sound they made when they were dialing was so cool. Uhmmm. Or so I found out when I visited the American Museum of Telephones and Telegraph. P.S. -- I remember....I mean I looked up Bob Newhart's phone routines on YouTube. They're pretty damn funny. It's all in the timing. I agree completely about call waiting. It's bad enough when a freakin' corporation puts you on hold, never mind a friend! This is the second TT that's mentioned a Princess Phone. . .I must have missed something down here in the Antipodes? And you're so right about call waiting, if someone put me on hold . . . I would hang up! Mike: Hey did you see a couple of cans joined by string there, like I used to see on cartoons when I was a kid? Silver Fox: Yeah, some friend, eh? Baino: Must have been an American/Canadian thing. 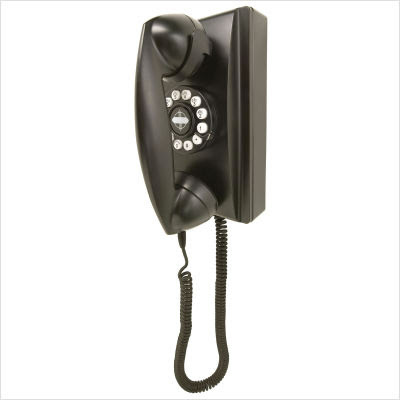 We actually had a party line with no dial... you had to ring up the operator by turning a little crank on the side of the phone. Hey, it was in Iowa! Cat Lady: And they thought I was old! Our ring was 2 long 1 short. Yep, those were the days when you had to stand in the hallway by the kitchen in order to use the phone. Our cord wasn't long enough to reach the table, so mom put what we called a stacking stool by the phone so there would be a place to sit. You don't find those stools around anymore either! Haha my word verification is eyerat, I'm no stool pigeon and I don't rat people out...lol. Skye: Fascinating isn't it when we had one phone in one particular spot in the house. And everyone else in the family knew your business. Simpler times. nice piece of historical perspective...love the Newhart reference. He was always so funny. California Girl: Thanks CG. As an impressionable teen in the 60s I was a big Newhart fan.